Globally, 90.0% production of rice is in Asia, and Japan is one of the top producers and consumer of rice. Over the years Japan has been dependent upon the domestic production of rice instead of importing, but in past few years along with the exports, an increase in imports has been analyzed. The system known as gentan, which was designed to protect farmers from fluctuating prices, now has deteriorated the Japan agriculture sector, where the landowners pocket the government subsidy and keeping the fields left idle. On an average per person, rice consumption has fell down by 38.0% over the past decade owing to decreasing rice supply and growing preference for wheat and meat food. As per the government, gentan system is expected to be ruled out by 2018 that will bring out structural changes in the agricultural industry. Rice is Japan’s not only staple food but also has cultural importance and is famous for production of japonica rice variety. The technological advancement in Japan has led to heavy use of drones in spraying rice paddies. Also insect-detecting drones are under development to be used against white-backed plant-hoppers, an insect harmful to rice fields. In 2017, Japan recorded 28.0% growth in rice exports and is expected to continue its growth rate backed by the technology adaptation and roll out of gentan system. Goldstein Research analyst forecast that the Japan rice industry is expected to grow at CAGR of 1.73% over the forecast period. The factors such as government support in rice production, favorable climatic conditions, rising number of rice processing companies are majorly impacting the growth of Japan rice industry. 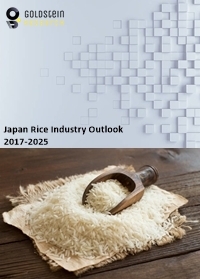 The report covers the present ground scenario and the future growth prospects of the rice industry for 2017-2025 along with the Japan rice production and revenue of Japan rice industry. We calculated the market size and revenue share on the basis of revenue generated from major players involved in rice processing across Japan. We have forecast the market on the basis of producers, suppliers and distributors, exporters and importers. On the basis of rice variety, japonica rice accounted for largest market share in 2017 with 87.2% of total rice production. Over the forecast period japonica rice is expected to continue their dominance in the rice production. Further, imports of aromatic rice have increased the market share and are expected to grow at a CAGR of 1.8% over the forecast period. Rice industry outlook 2017-2025, has been prepared based on an in-depth market analysis from industry experts. The report covers the competitive landscape and current position of major players in the rice industry. The report also includes porter’s five force model, SWOT analysis, company profiling, business strategies of market players and their business models. Japan rice industry report also recognizes value chain analysis to understand the cost differentiation to provide competitive advantage to the existing and new entry players. In the era of technology advancement, there is trend of producing genetically modified (GM) rice to ascertain the quality of rice and food security. Though commercially there is no production of GM rice, but many varieties have been approved for commercial production which is expected to boost the Japan rice industry. Thus Japan has developed a type of rice that can be grown in saltwater, a forward step towards sustainability. Rice is a staple crop for 70.0% of the world and thus the demand for rice is continue to grow over the forecast period. The food security concerns all over the world is driving the growth of Japan rice industry, which by reforming the rice cultivation practices from 2018 is expected to increase the supply and consumption of rice. Japan Rice industry report comprises of the following companies as the key players in the Rice industry: KURAGI CO.,LTD, Axes Co., Ltd., Sanyo Amnak Co., Ltd., Grand Jete Japan.